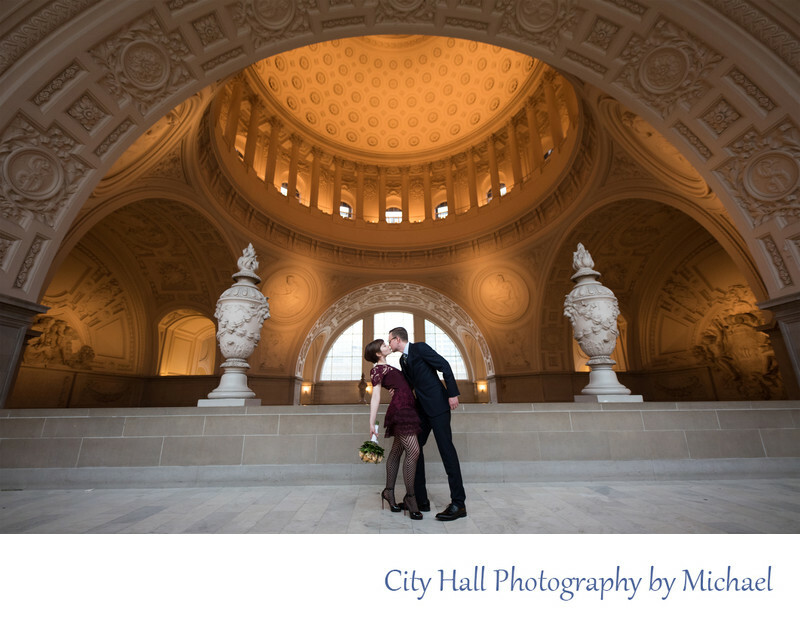 San Francisco city hall is arguably one of the premiere wedding photography destinations in San Francisco. In fact, many would rank it as one of best places for wedding pictures in California. We have been photographing weddings here for many years and have discovered some of the best places in the building to create amazing images no matter what time of the day it is. We decided to provide our clients with this useful guide that breaks down the best wedding photography opportunities on a floor-by-floor basis. 1st Floor - We thought it would be wise to start at the bottom floor. The first floor of city hall is of course the place where the famous Grand Staircase is located. As you enter the building and walk a few steps, it's the first major bit of architecture that greets you. The patterned marble floor is like nothing you have ever seen before and affords some creative photographic opportunities. We see so many photographers shooting up at the Staircase, but shooting down at it provides a great look at this impressive patterned floor. There are some great angles that really make for spectacular images if framed correctly. Please also keep in mind that the 1st floor is also the one with the most foot traffic, so it can be difficult at times to get a clear image. 2nd Floor - What can be said about the 2nd floor of SF City Hall? It has so much to offer in so many places. I have often said that if I was forced to choose one floor and one floor only, I would pick the 2nd. It is home to the Rotunda where most of the Civil Ceremonies are performed. The Rotunda itself offers incredible picture opportunities for any Lensman. Look across the way and you will see the Famous Mayor's Balcony with its distinctive, ornate gold railing and historical significance. We find that the Mayor's Balcony is the preeminent location to obtain expansive architectural images of the building. We place the bride and groom in front of the rail and shoot slightly up at them to make sure we feature the details at the top of the building. Seeing the dome from inside San Francisco city hall is impressive and we try to capture it for you the best we can. On each side of the 2nd floor are expansive Hallways with beautiful repeating lines which are so ideal for optimum wedding photography. 3rd Floor - The 3rd floor has the least amount of photographic space, but still offers some amazing locations. On the North side of the building you will find 3 of the most beautiful windows that are so ideal for picture taking. When professional photographers build their own studio, they always want North facing windows. Taking a bride and groom to the 3rd floor for wedding pictures is almost like bringing them into a private studio. The 3rd floor offers some of the best natural light in the building and it is completely controllable depending upon where you place the subject. It also happens to be one of the quietest floors in San Francisco city hall making it a nice escape from the crowds. 4th Floor - Did I save the best floor for last? Yes, probably though differing opinions exist. To me, the 4th floor offers the optimum natural light with it's huge windows that provide light for the entire building. You also get a great vantage point up on the 4th floor allowing a person to take in all of the architecture available. 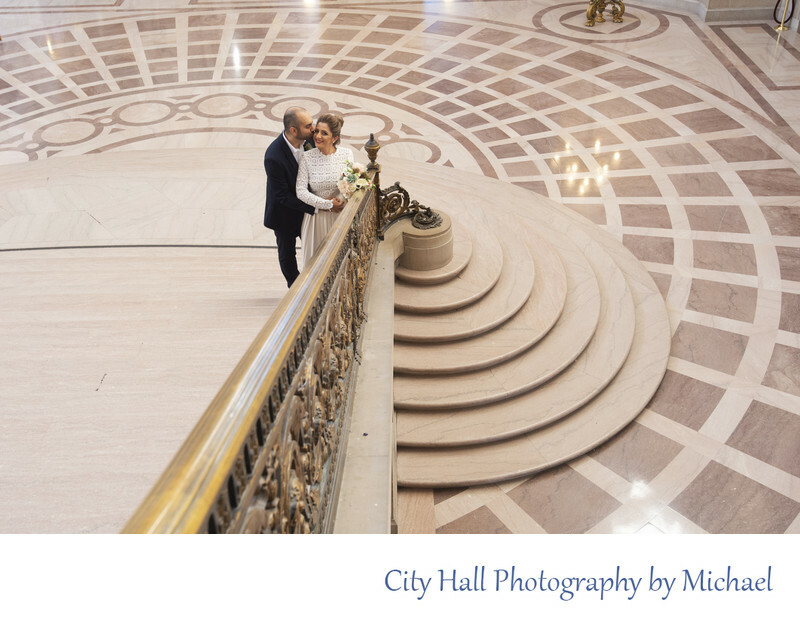 This is also the floor that offers an unsurpassed location for your San Francisco city hall nuptials. Book the North or South Galleries and the Event Office will set up chairs for your guests and ropes to keep the curious tourists out. For the inexpensive price of $1,000, all of this can be yours for a full hour. 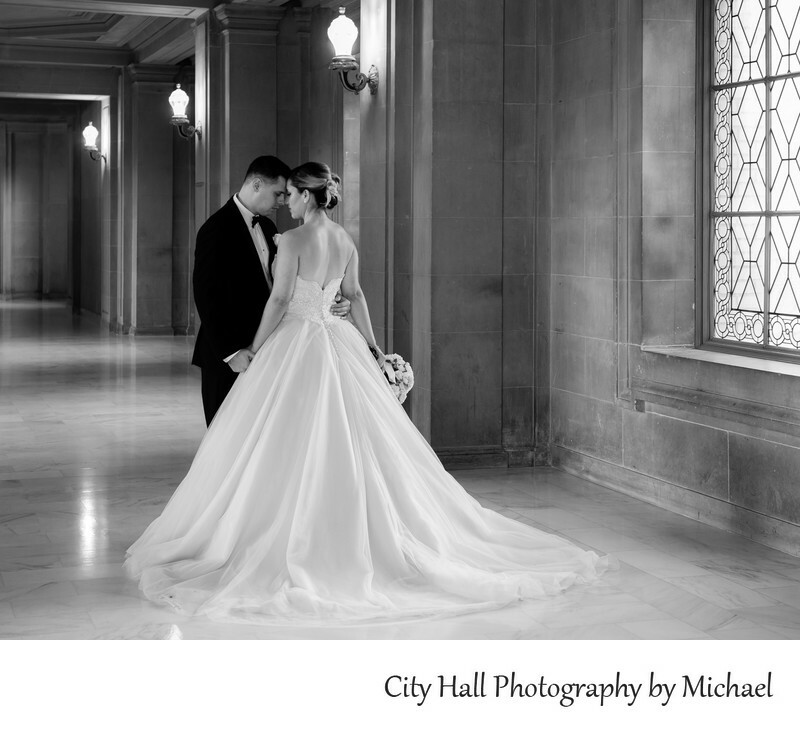 By far my favorite place for city hall wedding ceremonies!